C&C Roofing and Exteriors, Inc.
Look for us in your neighborhood! C & C Roofing and Exteriors, Inc. has been serving its customers for 20 years in Colorado Springs and Pueblo. We have installed thousands of new roofs and our prized reputation is built upon customer satisfaction, trustworthiness, reliability, and excellent business integrity. With the recent hail storm that hit the Colorado Springs area, we have claim specialists on staff to do free roof inspections to verify any hail damage. We can expedite your property claim and get your job on the schedule without any “out of pocket” costs. Dealing with all Insurance Claims is our expertise. We work with your insurance company and make sure ALL claim monies are included. Get on the schedule to get your new roof installed before winter! We guarantee all our work. Homeowners have had their fair share of damaging storms. 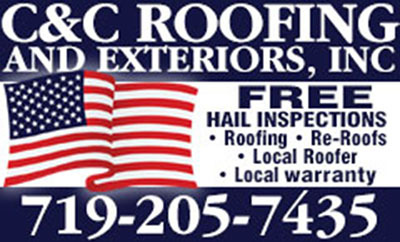 C&C Roofing and Exteriors, Inc. is licensed and locally established. We are ready to handle all your repair work. We currently hold an A+ rating with the BBB.